When we think of food banks, often the images and thoughts that come to mind are negative in nature and the Stop food bank was really no different. 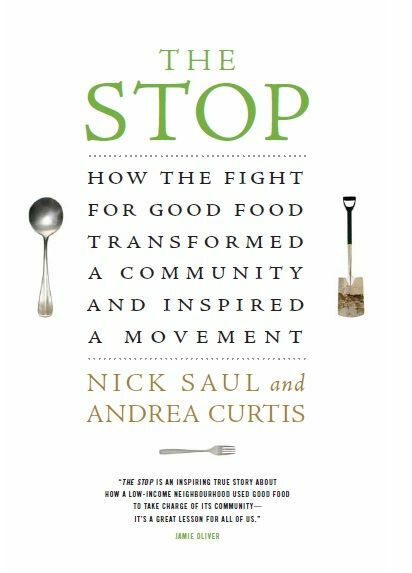 When Nick Saul came on board in 1998, The Stop was a little urban food bank. Like other food banks the food they could hand out depended on what stores and companies were willing to provide. Often these companies donate mislabelled items, items close to their date of expiration, or 'fresh' foods that were often wilted, slimy and just generally not items that people would choose to eat. Heck, even the description of some of these items was enough to trigger waves of nausea. It's little wonder in these circumstances that those people using the food bank would find the experience to be humiliating and would only use it out of sheer desperation. Staff and volunteers were often as discouraged and depressed as those seeking help. Things needed to change but where to start? Simple but challenging policy changes were put into place. Staff and volunteers had previously been trusted to use their own judgement on what a family needed and that worked just fine for the most part. With the new rules in place that left no room for personal judgement or exceptions, it's understandable that in the early days there was a great deal of friction, frustration, and in some cases even hostility. Over time though things started to run more smoothly and many new ideas were introduced with a result that is nothing less than phenomenal. The Stop has undergone a radical reinvention. Participation has overcome embarrassment, and the isolation of poverty has been replaced with a vibrant community that uses food to build hope and skills, and to reach out to those who need a meal, a hand, and a voice. What was once a simple food bank is now a thriving, internationally respected Community Food Centre with gardens, kitchens, a greenhouse, farmers' markets and a mission to revolutionize our food system. It began as a food bank. It turned into a movement. Two simple statements that immediately captured my attention when opening the book and glancing at the blurb inside the cover. 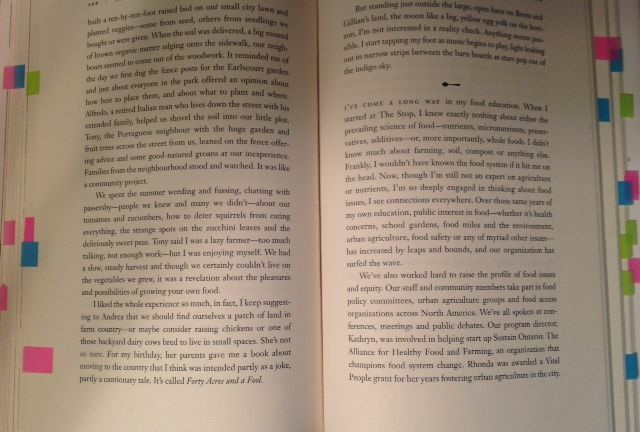 On reading the rest of the blurb, I was filled with a sense of excitement and couldn't help but dive into the pages. Just a couple of chapters in and I was hooked and I knew with absolute certainty that I would not be able to put this book down. I also knew that I needed a trip to Staples because I had run out of my little post-it flags that I use to mark the various parts of the book that I want to refer back to. In truth, I ran out some time ago but nothing really inspired me to need more, until now. The most serious barrier to real change is the philosophical divide between those people who see food as a pure commodity, something simply to be bought and sold, and those like The Stop and many others who view food as imbued with cultural, social, health and environmental significance. When reading The Stop, the quote above totally captures one of the ways that this book changed my life. I just saw food as something to purchase for the most part. Food was just something to prepare, even from scratch I didn't really think past going to the supermarket and buying the ingredients. That has completely changed and while some of my food related habits may stay the same right now out of necessity, long-term I really see a different reality for my husband and myself, including growing some of our own foods. Shouldn't we be taking into consideration the cost to our health care system and the impact on the environment of industrial processed food? I think that big food companies are privatizing profit and socializing cost -- reaping the monetary rewards of cheap, processed, fuel-intensive food and passing the cost of the health and environmental fallout on to the public purse. That was the quote that really stopped me in my tracks. Yes I've always known that processed foods are a huge factor in certain health issues such as diabetes for instance, or any health issue at all that is complicated by obesity. That was the quote that caused me to really start asking myself some tough questions like how much longer was I prepared to keep lining the pockets of these large companies while impacting my health in a negative way? As lengthy as this review is, it doesn't even begin to cover the experience of reading The Stop. It's a title that will remain on my bookcase for many years to come, and will be referenced often. There was only one thing that I disliked about this book and that's the number of titles I now have to add to 'Mount To-Be-Read' because they were mentioned in this book and piqued my interest. (If you check the image above again, of the post-it flags, the pink flags are all the book titles I want to read, including 'Good Food for All - a cookbook of recipes from The Stop's kitchens). March 26 - You're here. This sounds like a really good book - informative and engrossing! It definitely is! It's my favourite non-fiction of the year so far. I always find it exciting when books dealing with serious issues include a way to solve them.